The following walks are in the areas that are used for filming the BBC Poldark series. The storyline of Poldark may seem romantic, but the history of the places where it was filmed is in many cases even more dramatic than the fiction that is portrayed there. A circular walk around Cornwall's most iconic mining remains, used for the filming of the BBC's Poldark series In Poldark, Levant mine is cast as Tresidders Rolling Mill and the Crown Mines engine houses on Botallack Head also feature as Grambler. The West Wheal Owles engine house was partly reconstructed for the filming of Wheal Leisure and Wheal Grace. A circular walk between St Agnes Head and the engine houses of Wheal Coates via St Agnes Beacon, with spectacular panoramic views The area around St Agnes Head is cast as the Nampara Valley in Poldark. A (bus-assisted) one-way walk along the coast with spectacular wildflowers and one of Cornwall's most photographed views over the volcanic rock stacks of Bedruthan Steps, which Victorians liked to think of as a giant's stepping stones. Park Head is used for some of the horseback scenes in Poldark series 2 and Porthcothan is used for Nampara Cove. A circular walk between Constantine Bay to Porthcothan via nature's swimming pool at Treyarnon beach and a spectacular series of islands, headlands and tiny coves named after wine and pepper smuggled there, and the rock where a customs officer was left by smugglers to drown. Porthcothan is one of the locations used for Nampara Cove in Poldark. A circular walk from St Breward across the Treswallock Downs to the curious prehistoric structure of King Arthur's Hall and ending at the mediaeval Old Inn. Looking over the stile from King Arthur's Hall you can see Ivey Farm in the distance which is cast as Nampara in Poldark. A circular walk between the sheltered cove at Porthpean and the historic port of Charlestown, originally built to export copper, then China Clay, and now used for filming by Hollywood and Poldark. Charlestown harbour is featured throughout Poldark as Truro harbour. A circular walk with spectacular coastal scenery from Porthcurno to Penberth Cove, passing the famous wobbling boulder of Logan Rock and returning via the escape route from the wartime tunnels which housed one of the world's largest telegraph stations. The huge sandy beach of Pedn Vounder appeared in the first series of Poldark and its more well-known neighbour, Porthcurno, appears in the second series. Penberth Cove is used as the site of the forge and the slipway also features regularly. A circular walk around the iconic landmarks at Minions, including The Hurlers stone circles, The Cheesewring and the engine houses of the South Phoenix Mine. Cradock Moor near Minions is featured in the opening scenes of Poldark and also also where Ross was taking Demelza back to Illogan. A circular walk with spectacular views of the rock stacks at Bedruthan Steps about which the myth of a giant's stepping stones was concocted for the amusement of Victorian tourists flocking to Padstow and Newquay on the new railway. Park Head is used for some of the horseback scenes in Poldark with the rock stacks of Bedruthan Steps forming background imagery. A circular walk from Holywell Bay past the remarkable sacred spring and along the coast to the sandy beaches of Porth Joke and Crantock, returning via the poppy fields of West Pentire and the Cubert Common nature conservation area. 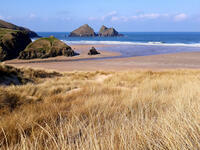 Holywell Bay features in the second series of Poldark with Ross and Eleanora galloping their horses across the beach. A circular walk through the Lizard National Nature Reserve from Predannack to Kynance Cove along the rugged Serpentine cliffs where the "great silver ship" was wrecked in 1616 and more than 700 Spanish silver coins have so far been found. Kynance Cove is used for some of the Nampara Cove shots and Predannack Wollas is used for the horseback charges. A circular walk from the Loe Bar to Dollar Cove passing the wrecks of treasure ships whose cargo still washes ashore, returning via the Halzephron Inn which still has a trapdoor leading to an underground network of tunnels used by smugglers. St Winwalloe Church at Church Cove was used for filming the funeral of the daughter of Ross and Demelza. The wrecking scenes in Poldark were shot at Dollar Cove. A circular walk from England's only Cape, via the engine houses of Kenidjack Valley and perched on rock ledges at Botallack Head, to Levant Mine which had over 60 miles of tunnels beneath the Atlantic and now has a working restored beam engine. In Poldark, Levant mine is cast as Tresidders Rolling Mill and the Crown Mines engine houses on Botallack Head also feature as Grambler. The Wheal Owles engine house was partly reconstructed for the filming of Wheal Leisure and Wheal Grace. A circular walk along the coast between the golden sandy beaches of Chapel Porth and Trevaunance Cove at St Agnes via the iconic engine houses of Wheal Coates, perched above the breakers. The area around St Agnes Head is cast as the Nampara Valley in Poldark. A circular walk featuring some of the most spectacular scenery of the North Cornish coast including the rock stacks of Bedruthan Steps, the azure lagoon of the Trescore Islands and the sheltered golden sandy beach at Porthcothan. Park Head is used for some of the horseback scenes in Poldark with the rock stacks of Bedruthan Steps forming background imagery. A circular walk to Padstow from Trevone beach, which tracks the route taken by sailing ships along the rugged Atlantic coast to the daymark at Stepper Point, past the infamous Doom Bar and the sandbanks of Hawker's, Harbour and St George's coves before finally reaching safe harbour in Padstow. The entrance to Camel Estuary near Padstow is featured in the first series of Poldark. A circular walk along the rollercoaster path from Port Quin, descending into Port Isaac, with spectacular views of the harbour, via the old houses of Roscarrock Hill including Doc Martin's, one with roof timbers tied on by an anchor chain, and the Sunday School with a bell from a shipwreck. Port Quin features in the second series of Poldark and was also used extensively in the 1970's Poldark series. A mostly circular walk to Cornwall's two highest tors passing prehistoric remains including the holy well, summit cairns and settlements. The iconic summit of Roughtor features in the moorland imagery forming a backdrop for horse-riding scenes in series 2 of Poldark. A circular walk from Porthcurno, passing the Minack Theatre, St Leven's Holy Well, Porthchapel and Porthgwarra beaches, to Gwennap Head where the English Channel meets the Atlantic and the Runnelstone Reef has claimed so many ships that divers are unsure where the wreckage is from. The tunnel to the beach, which features in the Poldark titles, was dug by tin miners from St Just. The beach is also used for the landing of the pilchard catch and where Demelza spies on Ross skinny dipping. The coastline around Gwennap Head often features when the Carne brothers walk along the coast. A one-way coastal walk, made circular via an initial bus journey, from the fishing port of Mevagissey to Charlestown - one of the best-preserved Georgian ports in the world and an engineering masterpiece which included a seven-mile-long leat. Charlestown harbour is featured throughout Poldark as Truro harbour.